Eugenio Merino says he can't understand the fuss as he'd already sold the piece to a Belgian Jew. 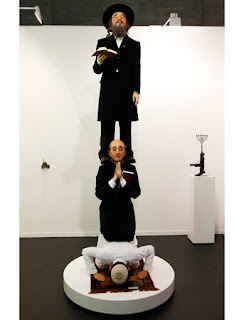 A display by a Spanish artist, including a candelabrum growing out of the barrel of an Uzi sub-machinegun and a sculpture of a haredi figure standing on a priest, who kneels on a prostrate Muslim, has drawn fire from the Foreign Ministry. The Israeli Embassy in Madrid issued a statement Wednesday protesting the display at the International Art Fair in the Spanish capital. "Values such as freedom of speech and creative freedom are sometimes used to disguise stereotyping, prejudice and provocation for the sake of provocation," the statement said. The sculptures are two of five works on display by the well-known artist Eugenio Merino. Merino denied that he had tried to provoke. "The aim was to display the wonder in the co-existence of the three religions, each making a common effort to reach God," he told reporters.